The historic Percy & Small Shipyard site at Maine Maritime Museum is the only intact shipyard in the United States where large wooden sailing ships were built. The shipyard is complete with its original buildings, except for one – the blacksmith shop, which was torn down in 1939. That building had replaced a previous building that was destroyed by fire in 1913. The pre-fire building would have contained the blacksmith shop that was responsible for producing the metalwork that went into building Wyoming and many of her sister ships. And produce it did. When Wyoming was launched on December 15, 1909 at the P&S Shipyard, she had 300 tons of iron and steel in her fittings, fastenings and strapping. Thanks to a generous bequest from former Trustee Kenneth D. Kramer to construct a Blacksmith Shop exhibit on the site of the original building, the complete shipbuilding story of the great schooners can now be told. The building is named in honor of Ken for his legacy. 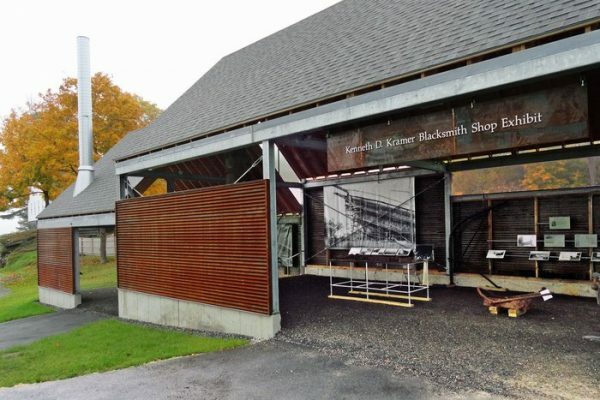 Because virtually no information about pre-1914 building is available, The Kramer Blacksmith Shop Exhibit is an evocation of the 1914 building, approximating its original dimensions of 84 x 26 feet and location due east of the Paint & Treenail Shop. To preserve the integrity of the shipyard’s intact historic buildings, this new structure is not a historical recreation of the original building, which would be “fake” history. Instead, the proportions, dimensions and materials used evoke the original building and its purpose while clearly being a contemporary building. The structure houses exhibits related to the blacksmith operation that transpired there while also providing a gathering place for tour groups and visitors. On occasion it is the site of blacksmithing demonstrations.